This means I have a busy week ahead. My to do list includes such fun things as vacuum, steam mop the kitchen…. slightly more fun things in working on ASL and Themedom….absolutely more fun things in having fun on Preshus Babies, writing 20,000 words minimum on Babypire and do a plot outline for TinkerHook since I had a breakthrough at about 1am this morning about Peter. How is everyone else’s week ahead looking? Time to get busy for me. Also, I’m thinking of putting the sort of prologue of TinkerHook up this week, who is in for that? So today I wrote something. One word. Love. I wrote it on my wrist in support, along with many other people, for those who suffer from the darker thoughts, who might or have thought about hurting themselves or ending their life. It’s not really a secret, I’ve been open about it. Not for the attention, not to say look at me I hurt my wrists, I took too many pills, I tried to drown myself in alcohol like the guy on Constantine, but because talking about it has always made it more real and easier to deal with for me. I hid it for a long time, most of those closest to me had no idea what I went through, that even when life was great I was still crying inside and wanting to just run. I still struggle. But talking about it and not feeling that I have to hide it and be ashamed of these thoughts or my actions make it easier for me. There are a few people that know the extent of how bad it has been for me in moments, people that have talked me down when I’ve told them goodbye. And yes, sometimes it is a cry for help, sometimes I didn’t intend to do it, sometimes I just needed the help to get back from the darkness. I used to get a lot of negativity for having a cry for help moment, but honestly, for me it took strength to even do that and ask for help. There is NEVER anything wrong with asking for help or with needing help. I was not strong enough to do it alone. I don’t know if I am still. Anyone who follows me on my various places of social media will have seen the darkness come and get its grip on me. Sometimes it can last for as little as half an hour; sometimes it can last for months. Early last year it lasted for a long time. And I walked that path. I wanted it all to end; I felt that I couldn’t take it anymore. No one knew until it was almost too late. May 2011 was my lowest point and became my highest point because I came out the other side stronger. I have systems in place now and people to turn to when I can’t take it anymore, when I can’t go on. I have found my reasons to keep going. The things that matter inside of me. One, and the most amazing one for me, is my son. I am strong for him and he makes me strong. I think I’m rambling as I tend to do. But what I am saying today as my twitter feed is filled with so many people offering insight, support and love to a world touched by depression and suicide daily, is that I get it. I’ve been there and I came out the other side. I am there for anyone who needs someone at any stage even if I’ve never met the person before; I want to be there like I had people there for me. I have love written on my wrist because I am still here and I want you to be here tomorrow too. And I also want to say thank you to those people who have been there for me. Who have helped me back up. Who have saved me more times than I can possibly count; from those who are loved ones to people who just offered a hand at the right moment. Thank you. 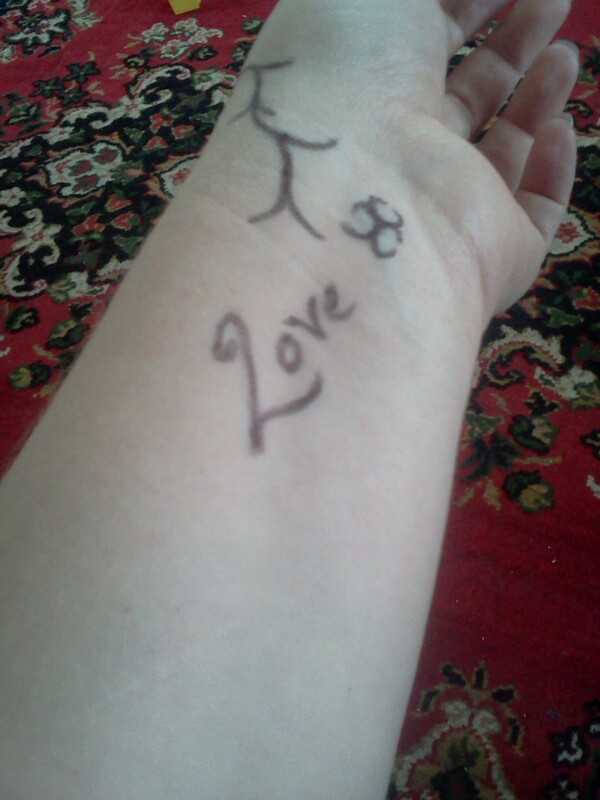 I would not be here today without people showing the love that I’ve written on my wrist.